You may have been a little confused when the advertisements rolled out, including the full back page of the Inlander, announcing that Ted Nugent would be playing the Coeur d'Alene Casino in August. First off, you'd be forgiven for not knowing who Ted Nugent is if A) you aren't a fan of 1980s agro-rock or B) you don't watch Fox News (or The Daily Show, for that matter). But if you do know about Ted Nugent, you, like me, probably thought he'd given up his guitar in favor of shooting large animals, campaigning for losing presidential candidates, sitting on the National Rifle Association board, and getting investigated by the Secret Service for implying that he was going to harm the president. 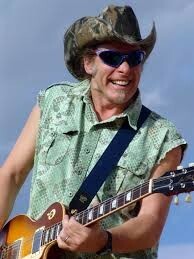 But yes, Ted Nugent does still tour as a musician. He's playing a theater in New Jersey tonight, in fact. Nugent's show slated for Aug. 4 at the Coeur d'Alene Casino, though, has been canceled by the venue after the Tribal Council learned of Nugent's history of ridiculous, racist and violent rhetoric. “The Coeur d’Alene Tribe has always been about human rights – for decades, we have worked individually and as a Tribe to make sure that each and every person is treated equally and with respect and dignity. We know what it’s like to be the target of hateful messages and we would never want perpetuate hate in any way,” said Chief Allan, Chairman of the Coeur d’Alene Tribe in a statement released yesterday. The tribe asserted that they were unaware of Nugent's penchant for controversial rhetoric until they got a call from Bill Morlin, who you should remember from his excellent work over the years for the Spokesman Review, who now writes for the Southern Poverty Law Center's Hatewatch blog. Click here for Morlin's account of what transpired when he asked the casino if it saw anything controversial in booking Nugent. Hours later after Morlin raised the question, the casino had canceled the show. Nugent's most known racist remark is when he called the president of the United States a "subhuman mongrel," but he also penned this editorial about why the Washington Redskins shouldn't have to change their name. In the piece, Nugent says his song "Great White Buffalo" has made him beloved in Native American communities. A viewing of him performing that song in a headdress (see above) makes that somewhat hard to believe, as well as him saying things like, "Call me crazy horse..."
This isn't the first time the self-proclaimed Motor City Madman (he gave himself the name because he's from Detroit and he's crazy) has had a show canceled for being, at best, a little out there. A city in Texas agreed to pay him $16,000 not to show up at their Fourth of July festival this year.